Patron: "Why do I have to pay so much if it only took you 10 minutes to draw this?" Artist: "Because it took 20 years of practice, for me to do this in 10 minutes." Because doing something for free or getting tokens in exchange of our work, or some would call passion, doesn't keep a roof over our family's head, food on the table, or keep the power on. Think about it for a second. Everything that you see, interact with, buy, wear, etc was designed by a visually creative person. From the shoe and the swoosh on the Nikes you bought to the type logo that adorns your dentists letterhead. People seem to forget that the visual element is such an integral part of a product or service's identity. Your willing to pay for the product, why shouldn't the person that made you want to buy that product get paid for their time, talent, and effort. There is a common misconception that art is just "fun". "Oh you just draw and paint. Isn't this something you do in your spare time for fun?" NO. This is hours of agonizing over every tiny detail to make sure it's right, that it does it's job, and meets the demands of the client. Not to mention a lifetime of practice, education, and experience. But if someone doesn't want to pay for it, fine. Do it your damn self. Just because we pursue a field of work that seems less serious and mundane to some, doesn't mean it is. We work hard, if not harder for every single job or opportunity we get. It is quite disappointing when some people see art as a 5 minute job or something that would not cost much just because of the fact its on paper or in any other medium. I have a lot of people ask me well why does it cost so much. There are so many factors that they don't consider like over heads, bills to run the business, advertising, profit, materials, labor, insurance, etc. In many ways we as designers, makers, artisans, etc., need to educate our clients and to not second grade our work as at the end of the day. It's a gifting that we have honed with patience, time and concentration. We have worked hard for this to make a living and sacrificed so much. That is why it's priced that way. That is why it's not for free or discounted.Art is still a business and artists have the same living expenses as everyone else. Art serves a purpose and artists deserve to be paid for their work. Creativity is a long and arduous process. People think art is a magical power not something that takes work. They think you just put a pencil to paper and it "happens." 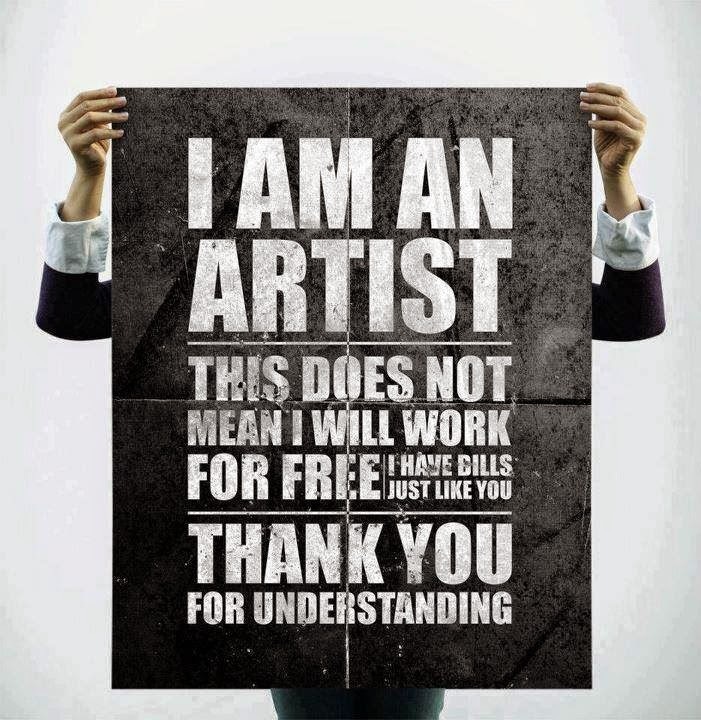 Artists' do not create solely for monetary gain, but with our society, they need money to eat, buy supplies, and LIVE! I understand where the author is coming from. Most people think that artists just do whatever they want on paper and then bam, sell it with a very high price. It doesn't work that way, they pour their very soul and every bit of what they have on what they do. They don't just do mental work but physical too. I think that artists aren't given much importance not just in our country but also around the world. I hope that one day every artist in the world will be looked up to and be respected.